Norway rats have made an impression on the general public due to their numbers and size. While you might think these rats are only seen scurrying around the streets and subways of NYC, these common rats are also found in other places, including Newark. One city worker managed to catch a Norway rat that measures 2 feet long and weighs just under 3 pounds. Norway rats live in large groups in tunnels and burrows underground, which they spend a lot of time digging. Some are also found in wood piles, ponds and other areas, if there’s plenty of food sources available. Norway rats are brownish or grayish in color and have a white belly. They have small ears and scaly tails that are shorter in length than their bodies, unlike their long-tailed roof rat cousins. Norway rats are considered a nuisance and a public health hazard because they carry harmful parasites and diseases that can spread to humans, such as Hantavirus and toxoplasmosis. When you have a Norway rat infestation, it’s important to have these rodents removed as soon as possible. Otherwise, they could end up making you and your family ill. They can also cause damage to your property with their chewing. If you’ve noticed Norway rats around your property, don’t hesitate to call Allison Pest Control. Our experienced Freehold exterminators will trap these pests and remove them from your property safely. Feeling itchy? 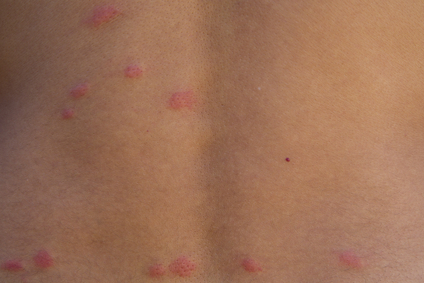 The problem might not be mosquitos, but rather a summer infestation of fleas. With warmth and humidity in the air, fleas become hyperactive. They reproduce more quickly, swarm yards and dog parks, and quickly create a filthy nuisance once they get inside your home. Summer calls for careful monitoring of pets that may be carrying fleas. Carpets and upholstery may house the fleas in spite of a flea collar, so the home may also need flea extermination. Female fleas only live a few weeks, but they lay thousands of eggs. Under mild conditions, it takes months for a flea to grow from larva to pupa to adult. Warmth and humidity rapidly accelerate their growth. Additionally, summer rains drive fleas up from the ground to higher levels. This increases the chances of getting a flea infestation after they attach to you or pet and come inside. Veterinarian Katherine Beier recently explained to reporters that pet owners need to keep several factors in mind: the number of pets, where they play outside and where they sleep inside, and what kind of flooring you have indoors. She finds that people often need to seek flea treatments for a wide radius around their dogs’ favorite resting spots. For safe and effective pest control for fleas in New Jersey, contact Allison Pest Control to protect your pets, family and home. For many Americans, the passing of the Thanksgiving holiday means that it is time to head to the local hardware store or roadside stand and pick out the perfect evergreen to welcome in the Christmas holiday season. Entranced with the smell of delightfully smelling needles, not many American’s will give a second thought to the possibility of insects living inside of a newly cut or live tree report Monmouth Country NJ exterminators. Home and business owners are often surprised to learn that there are many different types of insects that can be joining their holiday festivities once that beautiful symbol of Christmas has been brought indoors. Once insects are brought indoors on a Christmas tree, the warmth of the interior of a home will signal to any hitchhikers or hidden insect eggs that it is the start of spring. The development of many types of insects will then spread throughout the building, allowing the critters to be creeping around into cracks and crevices, walls, or on window sills as they look for a way to escape outdoors. It is not recommended that Christmas trees be treated with any type of pesticide as it will make the plant extremely flammable once the Christmas lights are attached and operating. If insects have found their way into your home or business on your Christmas tree, its time contact a Monmouth County NJ exterminator who will be able to eradicate any sneaky incoming pests. Is It Winter Itch Or Fleas Attacking You and Your Pets? As with humans, pets too can suffer from skin problems during the winter months due to the cold and dry air that they encounter. Many people do not realize that there could be another reason that their own skin and that of their pet’s skin can be red, irritated and itchy. Despite the cold New Jersey weather, fleas are waiting for you and your pet to pass nearby so that they can hitch a ride on their warm body. Once on board, fleas prefer to remain on animals but they are often dislodged by the scratching of pets; climbing onto you! Pets that are allowed outdoors can easily transport fleas inside and deposit them in different locations throughout a home. The most common places that fleas, flea eggs, or larvae can be found is in pet beds, soft furniture, carpets, the crevices of wood flooring, behind floor boards, and human beds. Fleas are bloodsucking parasites that can lie in wait for a blood meal for an extended period of time. Like other bloodsuckers, they are attracted to CO2 that is exhaled. Fleas prefer to dine on cats, dogs, and other small animals, but will consume human blood when hungry. Once a flea bites, their saliva causes severe itching which can lead to a secondary infection. Due to the warmth of our homes, fleas will easily reproduce at alarming rates without proper treatment. Bug bombs or foggers are not recommended for flea control as they only kill on contact and do not reach deep into the hiding places of these bloodsuckers. The best way to safely eradicate fleas is to call an experienced Monmouth County NJ exterminator like Allison Pest Control.